When and Where Does BTaccess Operate? How Can I Help Improve BTaccess and Accessibility of Fixed Route? Bloomington Transit invites community members and visitors to take a free ride on an electric bus Tuesday, August 28. The demonstration of the 40-passenger Proterra Catalyst battery electric vehicle will take place between 12:40 and 7:30 pm along the 3 College Mall/E. 3rd Street and 3 Highland Village/Curry Pike routes. The Proterra battery-powered model is one of several comparable vehicles being considered for purchase by the transit system, which made a request for the purchase of an electric bus in its 2019 budget presentation Tuesday evening. The vehicle would be purchased using federal and local funds. The electric bus will depart from the Downtown Transit Center for an hour-long eastbound loop of Eastland Plaza, College Mall, and the Reserve on 3rd complex every two hours, at 12:40 p.m., 2:40 p.m., 4:40 p.m., and 6:40 p.m. The vehicle will depart from the Downtown Transit Center for an hour-long westbound loop of Whitehall Plaza, Highland Village, and Walmart every other hour, at 1:40 p.m., 3:40 p.m., and 5:40 p.m. Winner of the 2010 American Public Transportation Association Outstanding Transit System of the Year award for systems of its size, BT is evaluating the long-term economic and ecological impacts of electric vehicles in its fleet. BT’s current fleet consists of 80 percent diesel vehicles and 20 percent hybrid. 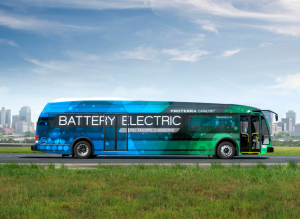 According to government data, battery electric buses offer significant savings in fuel costs, as well as lower price volatility than other fuels. Additionally, the vehicles produce zero tailpipe emissions, offer quieter operation and lower maintenance costs than their diesel counterparts, and have 30 percent fewer parts than a conventional bus. The Proterra model is in use in transit systems including Madison, Wis., Des Moines, Iowa, Duluth, Minn., Louisville, Ky., Lexington, Ky., and Nashville, Tenn.